Today is Mother's Day, and I want to wish all of you moms out there a wonderful day. But I also know that not all of us women are moms, and some of us women have even recently lost our mom, so it can be a tough day in some ways. So to those of you who struggle with this day, big warm hugs and special blessings go out to you. You are ALL wonderfully important and loved!!! Special buying privileges such as rebates, monthly coupons and opportunities to buy other exclusive products for your Cricut, from friends and partners of Provo Craft. Extra reward points and special cricut.com discounts. A members-only bracelet with an exclusive Cricut Circle charm. Access to a free, online version of Cricut magazine. 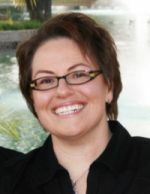 Inspiration and education from exclusive Cricut Circle webinars, swarms, meet-ups and events. Congratulations, surfnfroggie! Just email me at moniquegriffith@yahoo.com and we'll start tossing some ideas around. hi monique! i'd love a chance to win this! and happy mother's day to you! Love the Cricut Circle! Thanks for the chance to win! What an awesome treat. I would love to win this. Thank you Monique and ProvoCraft for the awesome gifts. I love the circle, sometimes forgot how much they have to offer. Looks like Cricut has been busy crafting...your flowers are beautiful. Have a blessed Mother's Day. Happy Mother's Day. I know this is an especially joyous Mother's Day for you. How awesome of PC to pick you and to choose pink flowers; how appropo. I would love to win a trial membership to test the waters. Happy Mother's Day Monique. I hope your day is special and blessed. Happy Mother's day! What a nice thing to do!! I am in the circle but would love to win this for my little sister who can't afford to be in the circle. Your so lucky to get these!!!! hope you have a ncie mothers day! Thank you for the opporotundity to win. I would like to have the chance to try the circle. Happy Mother's Day! Thanks for the chance to win! I would love to see what the Circle is all about! Lovely! How fun that you got the flowers! thanks also for a chance to win! i would love a chance to win a trial of the circle I have been trying to decide if i should join and this would help me make up my mind. Those flowers are so gorgeous!! Thanks for the chance to win a trial membership!! Congrats on receiving this lovely bouquet of flowers Monique ... how great of PC to do this, I love the thought behind it and the idea of sharing the "circle" love! I am a Circle member, and know that the winner's of these pretty flowers will love their gift too! Happy Mother's day! I had fun yesterday celebrating NSD with a friend scrapping all day. What a weekend :) Thanks for the chance to win. OOOH great giveaway. I would love to be a part of the cricut circle but jsut wasn't sure about the cost etc. So this would give us a chance to try it out! Thanks for the opportuniity! Happy Mother's Day to you all. This is an awesome give away and thank you for the chance to win. Since I spend my Cricut budget on cartridges, I don't have money left to join the circle. Would love to win. Happy Mother's Day. I am one who recently lost my Mom, so today is bittersweet. The flowers are beautiful! What a great opportunity! Thanks! Hi Monigue! Happy Mother's Day! Great bouquet! also what a great prize you are giving away..... sure would love to win it! Ahhhh! I would love to win a trial of the Circle! Can't afford to join myself right now, but it would be the BEST Mother's Day present to win this! Thanks, Monique and PC! Happy Mother's Day to you,as well! oh thank u for the chance to win this!!!! What a wonderful treat!! Hope you have a great mothers day Monique!! Thank you for the chance to win one!! How generous of you to share with us! Congrats to the winner and what a super sweet thing of you to share with us Monique!!! those flowers are awesome! and i would love to try the cricut circle, thanks for the chance. hope your mother's day is special! These are so beautiful Monique! I love everything about the cricut and would love an opportunity to be in the circle too!! Thanks for sharing and have a wonderful Mother's Day! Thank you Monique for thinking of us on Mother's Day!! YOU are so kind and thoughtful, since you too are a mother and celebrating as well!! And what a wonderful gift to receive!!! LOVE Provo Craft's generousity!! Also, Congrats to surfnfroggie for her great win!!! Happy Mother's Day to you, Monique!!!! I have never seen the cricut circle, but would love to. Thank you for the opprotunity. Thank you and PC for a chance to win. Those flowers are very pretty!!! Wow!!! How awesome is this!!! Happy Mother's day to you!! You are an amazing person. I followed through your journey during last yr, I just want to say that you are an amazing person!! What lovely flowers! Happy mother's day to all the women out there; if you're a mother or not, you're special to someone in this world. those flowers are so cool! thank you for giving us a chance to win! Monoque, I would LOVE to win a membership! I really want to be a part of the circle. Thanks for the chance & please pick me! Wow. Thanks for the excellent blog candy! I'd love to win a 3 month circle membership! Happy Mother's day to you!!! HAPPY MOTHERS'S DAY,everyone! Would love to win this wonderful prize! Monique Happy Mothers day. HUGS! I am so thankful you are so sweet to share! I would love to be in the circle! How great PC is for sending the flowers. I hope you have a wonderful Mother's Day. I've only had my Expression for six months but totally in love with it. Having the opportunity to win the Cricut Circle would be fantastic. I would love to win! Thx for the oportunity! Those flowers are so neat! Thanks for a chance to win an awesome prize! Would love to try Cricut Circle. Thanks for opportunity to try for 3 months! Would love to be part of the cricut circle! Thanks for the chance! Happy Mothers Day Sweet Lady! Happy Mother's Day to everyone. Thanks for the chance to win. They are beautiful flowers! I wonder what paper they used to make them with. Congrats to surfnfroggie! Lucky you! Thanks, Monique and PC for the chance to win the circle membership...I'd love to see what it's all about! Hi Monique and Happy Mother's day to you too. Hope you had a good time at the race yesterday. I'd love to win this fabulous giveaway. God Bless your week. Happy Mother's Day. Thanks for the chance to win. A Big Happy Mothers Day to you. I just love looking at your stuff and getting inspired from it. I would love a chance to win this! To all the mothers out there have a great day. Happy Mothers Day! Ooooh...aaaah...the circle. Sounds fun! Happy Mother's Day to you, dear Monique. It's been quite a year for you .... what a trouper you are. Love, love, love those flowers. Thanks for the chance to win and enjoy your day. I have so been wanting to try the Circle but I was taking classes to finish my degree and now DS is graduating HS next weekend. I finally am getting to a point where I could take full advantage. Thanks for the chance and Happy Mother's Day! Thanks for the chance to win Monuque! I am so Happy to see you back on the board .I would love to see what the Circle is all about! Hi Monique! I'd love to win this... Been thinking about joining but am not sure if it's worth it... This would help make the choice! Happy mothers day!! How fab! Congratulations to the winner and good luck to everyone on the new giveaway! Thanks Monique! Also, Happy Mother's Day! Happy Mothers Day!!! Thanks so much for the chance to win! It would be an awesome Mothers Day gift!! Happy Mother's Day to you too! I hope your day is sunny and bright and full of wonderful memories! Congrats to the winner! 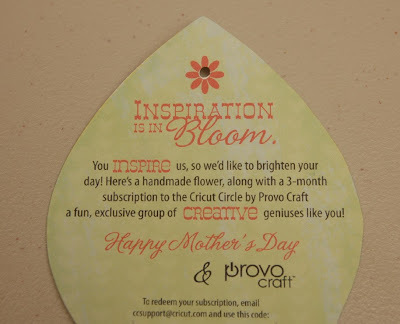 Thanks to you and Provo Craft for the chance to win this wonderful prize! Happy Mother's Day to you! 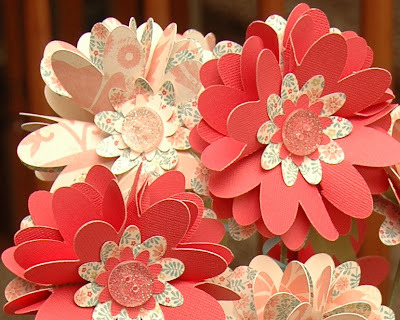 The paper flowers are awesome, love them. Happy Mother's day to you! The flowers are so pretty! Thanks for the chance to win! Thanks for the chance. Hope you have a wonderful Mother's Day yourself! Happy mother's day!!! The flowers besides being beautiful have a prize...yippee! Happy Mothers Day! Thanks for a chance to win this! And thanks for the mention of those of us who arent mothers. Even at my ripe ole age of 55...omg...am I really 55 now!! !...sometimes I at least feel a little sad and down that there was no child in my life. Don't get me wrong...I realize that if we had had a little one the chance of it inheriting Bob's md was there...and there is no way either of us wanted to take a chance on that. But sometimes smart choices sting years later! I'm lucky though!! I have 12 wonderful nieces and nephews and 15 great nieces and nephews to spoil! Happy Mother's Day to you. How very kind of you to do this for people. I miss my mum. In November of 2009, she suffered a seriesof strokes. She survived, but my sister moved her away to care for her. You see I, too had a series of strokes that left me unable to care for her at the time. She and I are now better, but distance separates us. My own daughter married and has also moved away. Many mum's are alone on this special day. You have done a lovely thing by making someone feel loved today! Monique I hope you have a wonderful Mothers day and that you enjoy those beautiful flowers! How wonderful. Such a beautiful bouquet of paper flowers. oh my goodness, i would love love love this prize. thanks for the op and happy mother's day weekend! Love these flowers. How nice of Provo Craft!! What beautiful flowers! I would love the chance to win a 3 month membership to see what the circle is all about. I would love to be in the circle. Happy Mothers Day. Happy Mothers' Day Monique and congratulations on the money you and your team raised for the CURE. I love the circle and it would be an awsome gift to win. Wow! Cricut circle... Pick me, pick me!! Monique Happy Mother's Day to you!!! The paper flowers are beautiful. I would love it if you could teach it as a class!!!! Have a great day!!! What an amazing surprise! I've been thinking about joining the circle for quite some time now. I've been saving so that I could do the yearly membership next time it's offered. A free trail membership would be just the thing to totally convince me. Who I am kidding? I know I am going to love it! What a sweet thing to share!! Keeping my fingers crossed! Thanks for sharing your beautiful flowers with us! Happy Mother's Day! Those flowers are beautiful. That was so sweet of Provocraft to send those out to some lucky ladies. Thanks for the chance to win! Congrats Surfnfroggie! I hope Monique shows us the layout she does for you! Monique, thanks for a chance to win a 3-month membership to the Cricut Circle! Thanks for sharing your flowers with us. I would really like to try the Circle out. I always wondered what it's all about. I just don't like to pay for something when I don't know what I am getting. So this way I could try it out and see if I like it. Happy Mother's Day!!! I would love the chance to win a 3 month circle membership. I just can't seem to justify the money so maybe this would give me the kick I need to explore! wow... what a great surprise!! I would love the chance to win!! Thanks for sharing 7 Happy Mother's Day!! 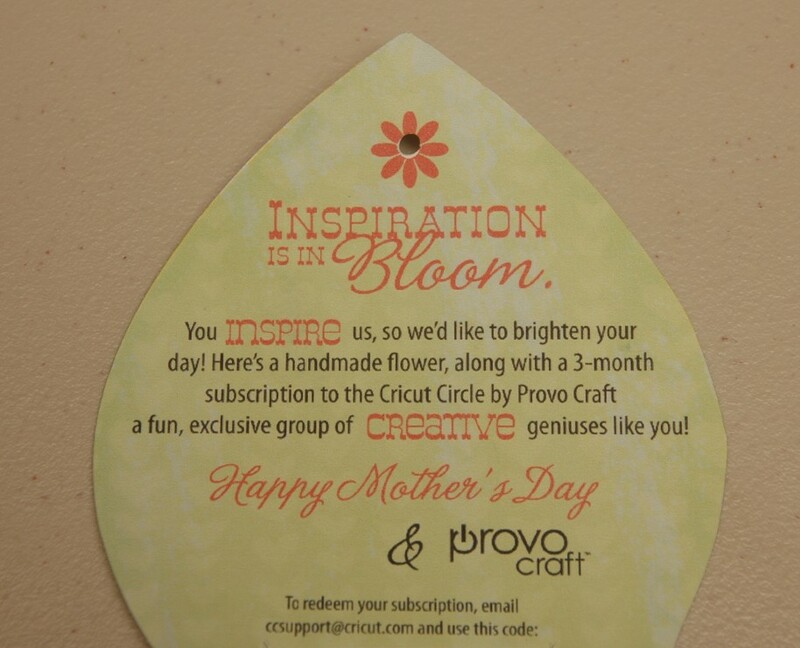 That's so cool that Provo Craft sent you the flowers and the tags! Wow the flowers are gorgeous! You have no idea how badly I want to be in the circle haha so this is the ultimate giveaway for me! Unfortunately on a student budget I cant afford to shell out the money to join to this would be an amazing win for me! Thank you so much for the chance to win! Always love your blog! Hapy Mothers Day to everyone! I hope you had a great race day! A free 3 mo. membership would be awesome. I've been thinking of joining the Circle, but wasn't sure it was for me. Happy Mother's Day. Hope you are enjoying it. I would love to win a 3 month membership. It would certainly cap off my great Mother's Day. Congrats on going over 2500 followers! What a beautiful bouquet (esp. the pink for you!) and thought behind it. Thanks for a chance to win this awesome gift. What a great prize! I just received my E2 Anniversary Edition for my Mother's Day. Cricut Circle would be a nice treat. I'll be back tomorrow! Beautiful bouquet from PC!!! Would love to be a member of the Circle, even if only for a short time. These flowers are so pretty. Thanks to you and Provo for a chance to win. Happy Mother's Day to you! 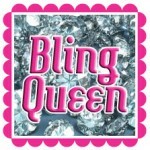 Thanks for the fabulous blog candy and for all your creative inspiration. Happy Mother's Day to all of you!! I hope you had a truly fabulous day. Thanks for the chance to win this great blog candy....always wanted to be in the Cricut Circle!! I would love to win a chance to "check out" the Circle!! Thank you, and Happy Mother's Day!! Thank you for your generosity in sharing flowers with your blog readers! I love the colors of the ones they sent you. Happy Mother's Day Monique. You truly are so inspiring , thanks so much for sharing your creativity with us! Also, thanks for the opportunity to win such a fabulous prize! Happy Mother's Day Monique! I would love a chance to belong to the Cricut Circle. Such beautiful flowers!! What a wonderful giveaway. Wow! You are so lucky to have received such an awesome gift. I would love to win. Thank you for the chance and for the lovely words you posted. Wow! What an amazingly GENEROUS give away! Happy Mothers Day to all if you beautiful women out there. We may not all be moms, but we are all someones daughter. And an especially happy Moms day to you, Monique, to Nana Susan, to Sweet Lucy, to Wendy and to Becca. Love and squeezy hugs to all of you! I was wanting to give my thanks to you for shaing your fight and giving me tools to use in helping my friend fight her battle against. I had to buy the stamp that said "fight like a girl". My friend like you will truly fight like a girl. Sounds like an awesome thing to share! Thanks for the opportunity to try to win the 3 Month Circle! I have wanted to try it and this would be perfect! Happy Mother's Day! Would love the chance to win. Happy Mother's Day to you. I would love the opportunity to win a Cricut circle membership. Happy Mother's day!!! I would love to win. Thank you for the chance to win. It is so great of Provo Craft to offer this gift. Also, thank you for mentioning how Mother's day can also be bittersweet. I hope you had a good weekend! These are really nice flowers! Happy Mother's Day, Monique. I know how you treasure each and every day as if it were a holiday! Today is a special Mother's day for me - my daughter's birthday falls on Mother's Day this year. Makes it a doubly special day for me! Wow, love these flowers. I have wondered about the circle and would love to win this to check them out. Thanks for giving us the chance to win this. I second the warm hugs to everyone who has a hard time on Mother's Day. My last childless Mother's Day was miserable. I love the paper flowers! I can't imagine anyone not wanting to try the Cricut Circle. It would be such a gift. I would so love love it. Thank you Monique for being you... you touch more people than you can ever imagine. Happy Mother's Day!!! Congrats to the blog candy winner!! Hi Monique! Happy Mother's Day and thanks for the chance to try the Circle. I have wanted to try it since it's beginning but just haven't jumped on-board yet. If I won, you know the first thing that I would do? Go order the E2!!! Since I can't afford to do both, I would just throw caution to the wind and go for it! Wow! I would love the chance to win this!! Thanks for sharing! Your flowers are beautiful. Happy Mothers Day! Wow! What a perfect way to try out the circle. Thanks for the chance to win. Happy Mother's Day. Thanks for a chance to win. I would love to win this. I have been tossing around whether to join or not and as much as I would like to, on disability I cannot afford it. I so would enjoy a 3 month trial to get my creative juices flowing. Love you Blog and go Team Monique!! surfin froggie...what a great name.....congrats...!!! Happy Mother's Day! This is the second Mother's Day without my mom and it was bittersweet. I celebrated with my husband and son and it was a wonderful day. I went and bought some rose bushes and veggie plants today in honor of my mom as that is what we always did for her on this special day. All in all it was a great day! What beautiful flowers and a great giveaway too. Thanks for sharing with us! Wow! I thought the was the nicest thing for provocraft to send flowers out to share! I would love the chance to win! THANK YOU!!! I had no idea about the Cricut circle--how cool. The flowers are very beautiful. Happy mom's day to you also. I hope you had a wonderful Mother's Day! I would love to try the Cricut Circle. Thank you for the chance. Really pretty bouquet of flowers! I would love to win this! The Cricut Circle sounds like a lot of fun! Happy mothers day! i would be thrilled to 'win' a 3 month membership!! TFS these..
What an awesome give away! I hope that this Mother's Day was extra special for you! Wow! These flowers are GORGEOUS! I'd like to know how to make them!! Thanks for the chance to win a great prize! Wow! Love the flowers!! Thanks for the great giveaway!! Hope you had a great Mothers Day!! Always wishing you the best!! 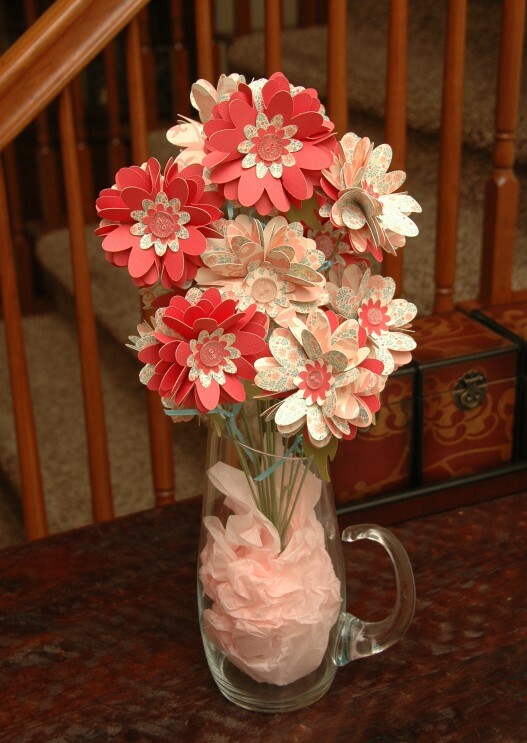 Those paper flowers are BEAUTIFUL & they won't wilt or die! And I would LOVE to win a membership to the Cricut Circle. I didn't know it contained all those things, wow! Happy Mother's Day, too! The flowers are beautiful!! Thanks for sharing them with us! :) I'd love to be in the Circle!!! I would LOVE to be a circle member!! So exciting! And I love those flowers! Thank you! I LOVE your work! What an awesome turnout for Team Monique, great job. I want to say thanks again for the chance to win a trial membership. Thanks Monique! I'd love to see what the "circle" is all about! I would love the opportunity to be part of the circle! Thanks for the chance to win. Its so great that provo craft has given you the opportunity to give these away, and such a beautiful bouquet of flowers! It would be wonderful to win this! These flowers are amazing PC did a great job. Happy Mother's Day Monique I hope you have an awesome day! What a fun prize. Hope you had a wonderful mother's day Monique! (My computer is down at home so I have to do my blog stuff at work! shhhhh! )I love those flowers and I can't wait to make some! I really want this cricut circle membership! Thanks for sharing your beautiful flowers and for the opportunity to win a spot in the circle! Wow! What a fun prize! I'd love to win a chance to try the Cricut Circle. Happy Mother's Day! I hope it was awesome! I would love to try out circle! I have wanted to for several months but just can't commit the $$ if I don't know if I will like it. This would be a perfect opportunity for me to try it first! Thanks so much for the chance! Wow, love those flowers! I want to know how to make them, mine never turn out that gorgeous. Thanks for the great giveaway and Happy Mother's Day to all! Lovely flowers and lovely opportunity you give us to win! Thanks! and Happy Mother's Day all year long! Thanks for the chance to win Monique! I'd love to try out the circle.